Produktinformationen "Chateau d`Aiguilhe 2011 (Chateau d`Aiguilhe)"
- 90 Punkte WINE ENTHUSIAST, Roger Voss: "Lean and austere, this is a firm, medicinal and herbal wine that?s still very young. Red berry fruits, along with drying tannins and spice from wood aging hint at its aging potential. It?s best to wait until 2016. " - SLEEPER OF THE VINTAGE bei Robet Parker WINE ADVOCATE: "A part of the charismatic and quality oriented Comte von Neippergs empire, this reliable, over-achieving Castillon boasts a dense ruby/purple color in addition to abundant black currant and black cherry fruit intermixed with notions of forest floor and spring flowers. A juicy, medium to full-bodied mouthfeel as well as super purity and ripeness, and beautiful integration of oak, acidity, tannin and alcohol suggest this delicious, front end-loaded value selection should drink nicely for 8-10 years. It is another sleeper of the vintage. Some barely noticeable drying tannins in the finish kept my score from going higher." 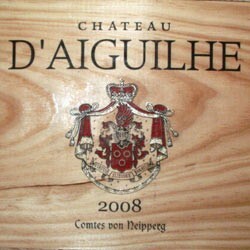 Weiterführende Links zu "Chateau d`Aiguilhe 2011 (Chateau d`Aiguilhe)"
Unser Kommentar zu "Chateau d`Aiguilhe 2011 (Chateau d`Aiguilhe)"